Specifically designed for Garmin Vivoactive HR Watch, easy access to all controls, buttons, sensors and features. -It would be a good choice for you to purchase this product if you own an Garmin Vivoactive HR Watch. You would never want to put it down because of its casual leisure look and the protective features. -Rugged protective case helps you to protect your Garmin Vivoactive HR Watch from bumps and scratches. -Made of soft silicone material, lightweight and durable, easy to install and remove. -Flexible wristband with smooth finishing for comfortable day to day wear. - Available in 10 colors in one set, meet your different needs. Rugged protective case helps you to protect your watch from bumps and scratches. Made of soft silicone material, lightweight and durable, easy to install and remove. Avaliable in 10 colors in one set, personalize your wristbands to match your different daily style. 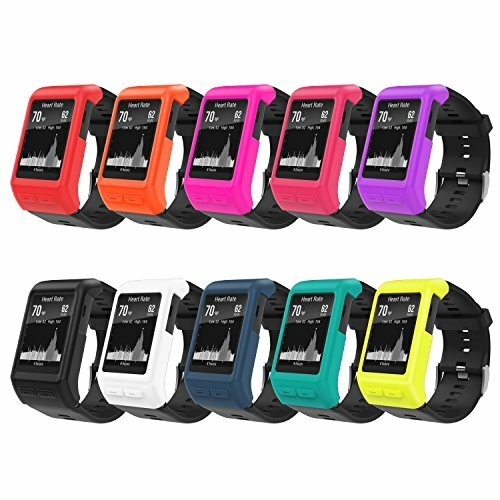 Please search "MoKo Garmin Watch" for other accessories offered by BSCstore.